Don't know when I became enamored with Mother Nature nor do I remember when I was told that it was a form of meditation but in any case, nothing impresses me more than what takes place in the world of nature. Yes, there is even beauty in hurricanes as destructive as they can be. I can spend hours watching what is happening in all aspects of nature which is constantly changing. I have 3 huge windows in my living/dining room area and I never close the blinds. No matter what time of day I walk into the room I am overwhelmed by what I see outside my windows. From the green trees to the sky they are always different as is the canal waters. Not only outside but inside I have 28 flower pots with 5 different colored geraniums, a few different species of cacti, poinsettias, a Cuban plant, pepper plants, just to name a few. No matter what is happening in a negative way in my life, not that much happens in that vein, they can always put a smile on my face. Every day there is something new to see. 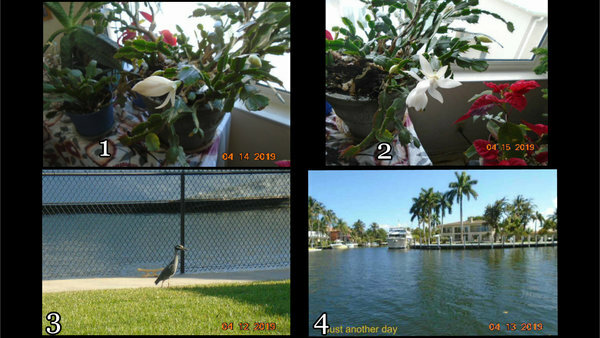 For instance, in pictures #s 1 & 2 you will see the 'Christmas' cactus that I got years ago ready to be in bloom (see all the buds) in time for Easter. What was supposed to bloom just in December now blooms 7-8 months a year. Also if you look behind the cactus you will see the red leaves of the poinsettias that I brought home in early December. In picture #3 is one of the many birds that visit 'my' backyard from egrets to bluejays to woodpeckers and, not to forget, the group of wild parrots that visit every afternoon making a lot of noise but their red and green colors standing out against the brown trunk and green leaves of what I call the 'Wilma tree' that was completely left bare, lost many branches but after 2 years was more beautiful than ever and has grown way over three stories high! Right now sitting at my desk I am looking out the 3 windows seeing it all. I titled #4 'just another day' because walking down to The Point, at the east end of our community, at the start of Karen Bay, we are surrounded by water, usually blue skies, million+ dollar homes, yachts with 350 days of bright sunshine. It is almost impossible to describe the evenings with stars and the moon shining over the water. We are 5 blocks from the very busy Sunrise Boulevard but you would never know we are in the middle of a big tourist city. Excuse me while I go out and take a walk and just look around at the wonder where I live! Yeah--2 males and 1 female--what's that all about??? I have a pair of bluebirds that come every season and nest in the tree right outside my window--also at one time I had 21 birds in my apartment----18 finches that multiplied like rabbits and 3 cockatiels--loved watching them.